Dorothy Elizabeth Renfro, 97, of Iowa Falls, Iowa passed away February 21, 2018 at the Scenic Manor Nursing Home of Iowa Falls. A memorial prayer service will be held at 4:00 pm Sunday, March 4, 2018 at the Linn’s Funeral Home Chapel in Iowa Falls. A time of visitation will be from 2:00 until 4:00 pm Sunday March, 4, 2018 also at Linn’s Funeral Home; 1521 Washington Ave.; Iowa Falls, IA 50126; In lieu of flowers the family is requesting that memorials be sent to: Shriners Hospital for Children; c/o Linn’s Funeral Home; 1521 Washington Ave.; Iowa Falls, IA 50126. Dorothy Elizabeth Adams was born February 11, 1921 to Benjamin Harrison and Mary Elizabeth [Cavender] Adams. She graduated from high school at the age of 16 in 1937. She attended the University of West Virginia and graduated with a Bachelors in Education in 1941, after which she taught Jr. High science in West Virginia. After teaching for a year she became a chemist for DuPont, and worked with them for ten years. She then took a direct commission as a First Lieutenant in the United States Air Force in 1952. On December 26, 1953 she was united in marriage to Robert Frederic Renfro, and to this union three children were born. 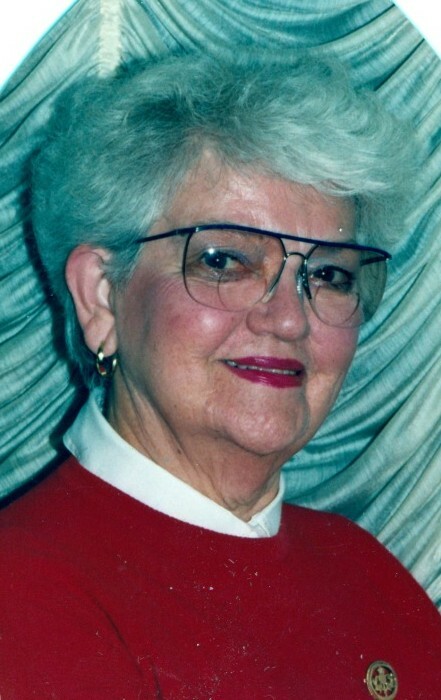 After she left the military, Dorothy attended and graduated with a Masters, in Guidance and Counseling, in 1958 from the Western Illinois University at Macomb, Illinois. After graduating, she went to work as an educator in Sioux City, where she and Robert resided for 50 years. They moved to Iowa Falls in 2008. Dorothy was a member of the Emerson Study Club, past member of the DAR Daughters of the American Revolution Candlestick Chapter, past member of the P.E.O Chapter DV, President of the St. Lukes Hospital Auxillary (Sioux City) and a member of the American Legion Hymen Peavey Post #188 of Iowa Falls. She volunteered her time for many causes, including Meals on Wheels, CASA, Knits for Kids, adult literacy, St. Luke’s Hospital Gift Shop, and transportation for chemo therapy patients. She volunteered for 11,000 hours at the St Lukes Hospital! She was an avid traveler, and Dorothy and Bob visited all 7 continents. She enjoyed collecting Delft pottery, and knitting. Her favorite hobby though was hiding the lids of jigsaw puzzle boxes from her children. Dorothy Elizabeth Renfro is survived by her husband: Dr. Robert F. Renfro of Iowa Falls; three children: Robin [Jeff] Heinzeroth of Alden, Iowa, Timothy [Gloria] Renfro of Rapid City, South Dakota, and Alexandra [Richard] Bankers of Sioux Falls, South Dakota; four grandchildren; two great-grandchildren; and two nieces and two nephews. Dorothy was preceded in death by her parents: Benjamin and Mary Adams; a brother in infancy; a sister Suzanne ‘Coozy’ [Howard] Wilson; a nephew and a niece.